Step 1 In a medium bowl, sift together the flour and salt. Place the flour and salt mixture in a large sealable plastic bag. Add the butter cubes to the bag and toss to distribute. Squeeze out the excess air before sealing. Step 2 Use a rolling pin and roll over the bag, flattening the butter into flakes. Chill the flattened mixture for 30 minutes, then sprinkle one-fourth cup water over the butter/flour mixture. Quickly stir until the mixture forms a dough that holds together when pinched. If the mixture is too dry, continue to add water, 1 tablespoon at a time, until the dough comes together. Be careful not to overwork the dough or it will become tough. Step 3Form the dough into 2 flat disks 5 to 6 inches in diameter. Wrap the disks tightly in plastic wrap and chill again. Step 4On a floured board, roll out each crust with a rolling pin to a diameter of about 12 inches (for a 9-inch pie). If the fruit is piled high in the bottom crust, you may need to roll the top crust a little larger than 12 inches; just make sure you have enough dough to go over the mounded fruit with a half-inch overlap. In Recipes-list.com we have selected the most viewed recipes from category - Desserts . Enjoy the best recipes specially selected for you! 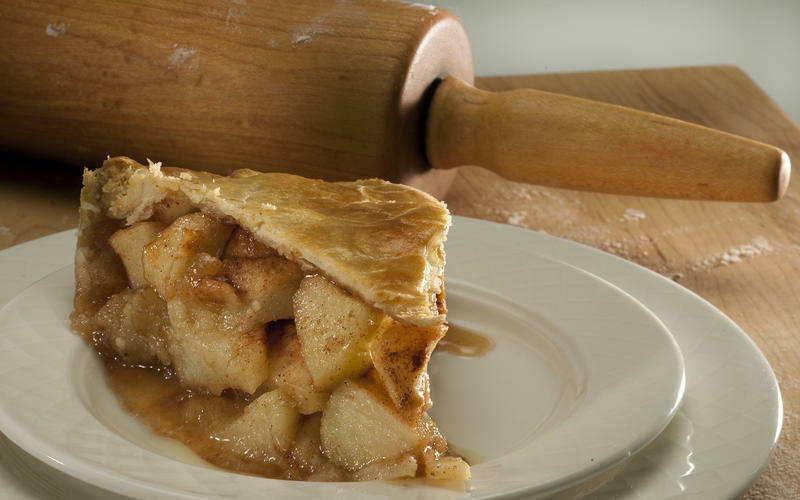 Apple pie is the right choice that will satisfy all your claims.